2000 AD's Rogue Trooper makes his triumphant return to the video game scene later this year as UK developer Rebellion reaches an agreement with Reef Entertainment to publish a new version of the 2006 Xbox, PC, and PS2 shooter Rogue Trooper: The Quartz Zone Massacre for the Nintendo Wii. 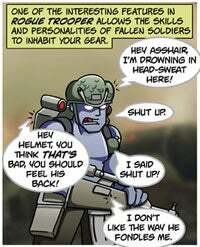 For those of you who don't remember, the story centers around the Rogue Trooper, whose squad mates are massacred by a traitorous general but live on through biochips installed in his equipment, a concept which inspired one of my favorite Ctrl+Alt+Del comics. The Wii release of the game will feature a new layer of polish, with the Wii controls supposedly making for more accurate and creative kill shots. If it stays true to form, it'll be the best damn game featuring a talking backpack since Dora the Explorer: Dora Saves the Mermaids.